Burmese border crossers push a boat headed back to Burma (the buildings in the background are in Burma) into the Moei River. 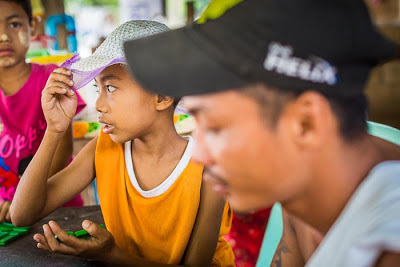 I went to Mae Sot primarily to photograph a story about drug resistant malaria. I had some extra time so I also photographed daily life in the border town. I think Mae Sot is one of the most interesting towns in Thailand. It's in Thailand but it's not really Thai - it's a blend of Burmese and Thai. It's a dynamic I've witnessed in border cities along the US/Mexico border and the Mexican/Guatemalan border. The border city in the more economically prosperous country takes in huge numbers of migrants from its less prosperous neighbor and businesses in the more prosperous country are happy to hire them. The migrants are looking for a better life, the businesses are looking for low wage workers. The "Friendship Bridge" over the Moei River between Mae Sot and Myawaddy is the official border crossing point. 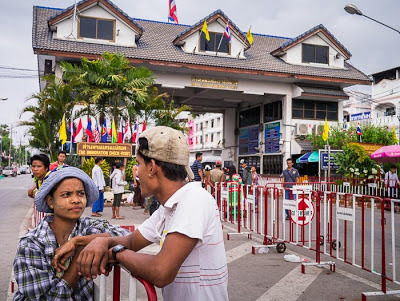 It's a busy place, Burmese and Thais, along with a few foreign tourists and businesspeople, line up to cross to Burma while a steady stream of Burmese, who have official crossing documents, cross from Burma into Thailand. 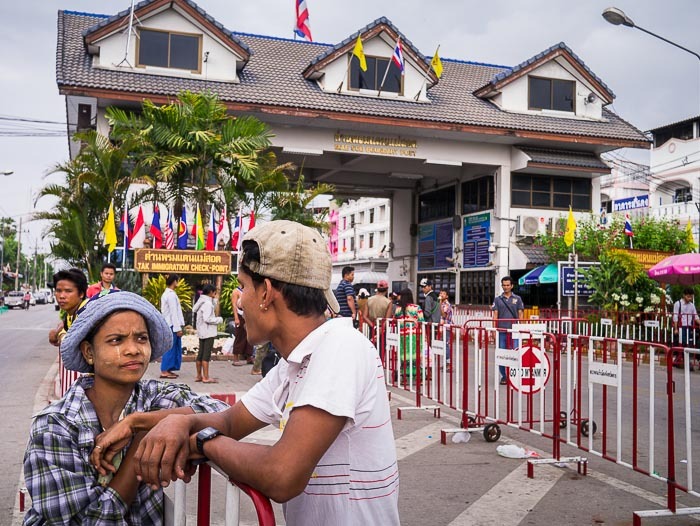 Burmese hang out on the Thai side of the Friendship Bridge in Mae Sot. But the really interesting stuff happens downstream, starting just below the bridge and going kilometers down the river. 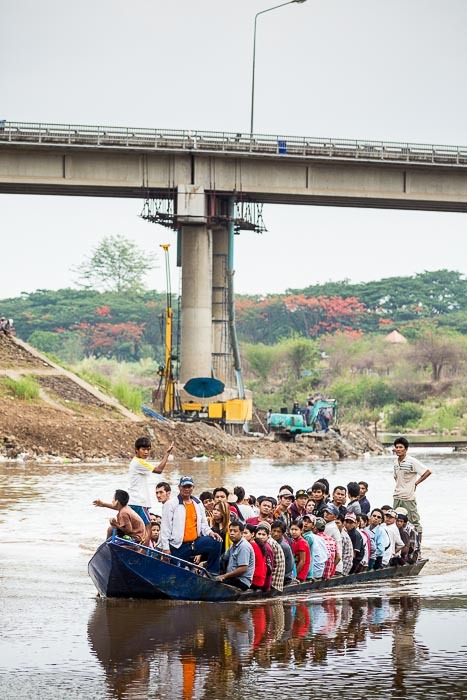 A steady stream of boats, packed well beyond capacity, cross the river bringing hundreds of Burmese into Thailand every hour. A boatload of Burmese border crossers approach the Thai side of the Moei River. The Friendship Bridge is in the background. 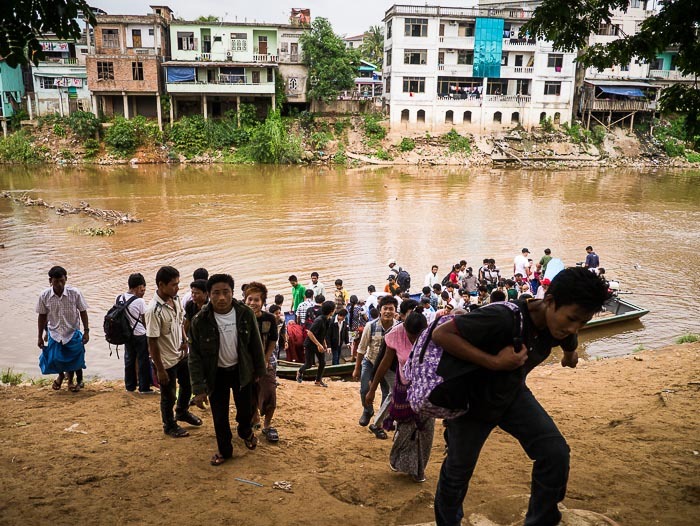 Passengers jump off the boats as soon as they make landfall and scramble up the riverbank into Mae Sot. People waiting to return to Burma line up and get on the boats as soon as the arriving passengers disembark. Much of this border crossing activity is semi-legal at best. Burmese scramble up the riverbank on the Thai side of the Moei River. Burma is the buildings in the background. 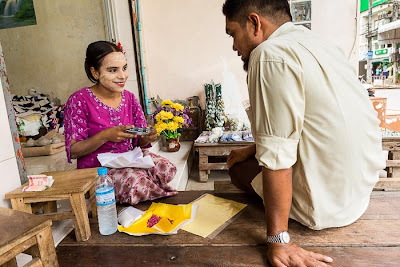 Most of the Burmese coming across here are on day trips to get medical care at the NGO clinics in Mae Sot that serve the Burmese community or hoping to sell stuff in the Thai markets or, more frequently, hoping to buy stuff in the much better provisioned Thai markets. That's clear from the amount of merchandise people returning to Burma carry back with them. 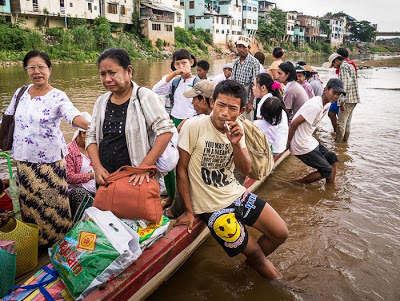 People who cross hoping to immigrate to Thailand usually cross further up or down stream - where there are fewer checkpoints. The Thais tolerate the day crossers because they provide a huge boost to the Mae Sot economy. There have been a lot of changes in Burma in the last couple of years and some of those changes have trickled out to the border. I've been to Mae Sot before, well before the democratization of Burma started. Then people crossed on inner tubes. Well armed Thai soldiers, covered by crew served weapons (mortars, machine guns etc) patrolled the riverfront. Burmese security officials had been known to fire randomly into Burmese communities in Thailand and on more than one occasion sent assassins into Thailand to kill Burmese political activists. It wasn't a war zone, but there was a heightened sense of things being not quite right. My Burmese assistant on that trip, for example, wouldn't go down to the riverfront with me because he was afraid Burmese security officials would shoot at him from sniping positions on the Burmese side of the river. Now the army is more or less gone. The few soldiers still on the border hang out in shaded checkpoints far from the river. The big weapons and vehicles are gone. It's a much less militarized, more relaxed place. When you leave the riverfront promenade and walk into town, the roads are lined with Burmese tea shops, Burmese monks in their burgundy colored robes (Thai monks wear saffron robes), go door to door collecting alms and the signs are in Burmese rather than Thai. Burmese play dominoes in a tea house a few meters from the river. There's a large market in the center of Mae Sot. It's called the Burmese market. Most of the vendors are Burmese and it's a great place to buy Burmese textiles and foodstuffs. A couple of blocks east of the market is a street lined with gem and precious stone vendors. Some have actual shops, some have stalls in storefronts and some just display their stones on the sidewalk. Buyers, who seem to be mostly Chinese and Indian, walk around looking for bargains; buying stones singly and in bulk. A Burmese woman sells precious stones on the sidewalk in Mae Sot. The gem market is a vestige of Burma's recent bloody past. Burma has a thriving mining industry. Precious and semiprecious stones from Burma make their way legally and otherwise into markets throughout Asia, including Mae Sot. The market in Mae Sot draws more than its share of buyers from around the world. Mae Sot is not really a tourist destination in Thailand. I have a hard time recommending it to people who come to Thailand to do the touristy stuff. But to me, Mae Sot is one of the most interesting towns in a country filled with interesting towns. There are more photos from Mae Sot and the Thai/Burma border in my archive.